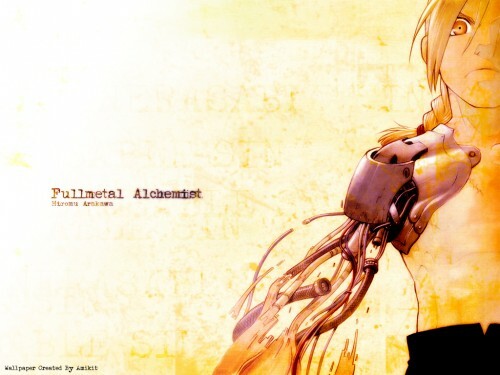 This wallpaper shows Edward Elric's shattered arm. This image (not mine) orignially came from the cover of the Fullmetal Alchemist manga artbook. I didn't really do much with this one. Just come minor touch-ups and CGing the background using the clone tool in Photoshop. Then I used downloaded custom brushes and lots of filters to finished it. Hope you like it. Don't forget to comment! More Comments! = More Wallpaper! Browse Fullmetal Alchemist Gallery: Recent | Popular. The white and bright left side could use some more details. Currently, the wallpaper doesn't look outbalanced, because the text alone can't hold the weight of the character picture all alone. my only complain is the size :( wish it's bigger... but other than that, i like! Very cool. The fu**** up arm looks sick XD Great FMA wallpaper. very cool looking wallpaper. Nice job on it! Nice job. Simple and to the point, I like it. That is one of the best pics i have seen i wish i could put it on my wall in my room. This wall is so simple...but so really like it!! There's always been something about this picture that caught me... the way you've done the background is a great texture foil to the drawing :) Good job! nice yellowish color in Edward and the background and a nice scan as well! ^_^ Edward looks so cute as always! very sweet picture of Ed this would make a very sweet background for anyones desktop!